Leema Acoustics introduces updated Xen 2 loudspeaker | What Hi-Fi? New version of the Xen 2 retains the five litre volume of the previous model, but comes with a wealth of performance upgrades. It's based on the original version, which was discontinued in 2008, but with a host of improvements for 2015. 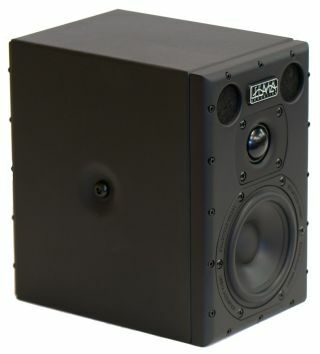 Leema Acoustics says the speaker can be positioned in “almost any home or studio environment”. The front baffle is the size of an A5 piece of paper (approx 210 x 148mm), and the cabinet is made from folded and welded steel which is 1.5mm thick. The steel is lined with a bitumastic layer and the cavity is stuffed with real sheep’s wool. The rear panel is also made from steel with bitumen on the inside. The crossover board uses Bennic components and air core inductors in an effort to reduce saturation and compression, and is attached directly to the terminals. In addition the Xen 2 features two "substantial" bass reflex ports, each measuring 26cm. Leema Acoustics has opted for two ports to “ensure that the speed of the air moving in the port is below 0.1x the speed of sound". The bass ports have been deliberately placed close to the drive unit to improve integration. Leema uses custom-designed drivers: the bass/mid unit is a “highly durable unit with exceptional cone excursion”, while the soft-dome tweeter uses a neodymium magnet and Ferrofluid-loaded coil. The company says this helps damp resonance and aid cooling. The Leema Acoustics Xen 2 loudspeaker is available now in silver with a veneered baffle for £1295.